Happy Monday everyone! Hope y'all had a wonderful weekend. Mine was super relaxing and productive. I have been working on a mini-bedroom makeover which I'm hoping to have done in time to share on the blog this Friday. The reason I'm calling it a "mini" makeover is because it primarily was just sprucing up the bed with new bedding/pillows/etc and also adding a new nightstand with new decor. So, this sweatshirt was just too cute not to share! I am a big fan of anything from Wildfox although I do feel like they can be a little overpriced. However, if you own anything from Wildfox you know that their clothes are SO soft and comfortable. I actually picked up this one (because the quote is SO perfect) over the Nordstrom Anniversary Sale so it is sold out. However, I linked to a couple other ones that I LOVE. I'm not sure if I have worn these shoes yet on the blog which is surprising because I wear them so often day to day! They are so cute, comfortable and are the perfect "transition" shoe. As the weather starts to get a little cooler but not cold enough for boots/booties, I love pairing these shoes (and my Chuck's of course) with almost anything. I love the whole outfit! So cute! The shirt just cracks me up! That is the BEST!! So so cute! I have been wanting some of those shoes too! I think I would wear them a lot! Can't wait to see your mini makeover!! Happy Monday!! I definitely agree with that slogan. The sweatshirt looks like a load of fun. Haha love that sweater! So true! Love this casual look! OMGEEEEE I totally need this sweatshirt!! So me :) Love this causal look! How funny is this! I really need to have this hanging on a sign in my kitchen! I love the sweatshirt, definitely made me giggle! Wahhh, that sweatshirt is adorable! And those shoes are really cute! Such a cute sweatshirt- and I love it with the leopard sneakers! 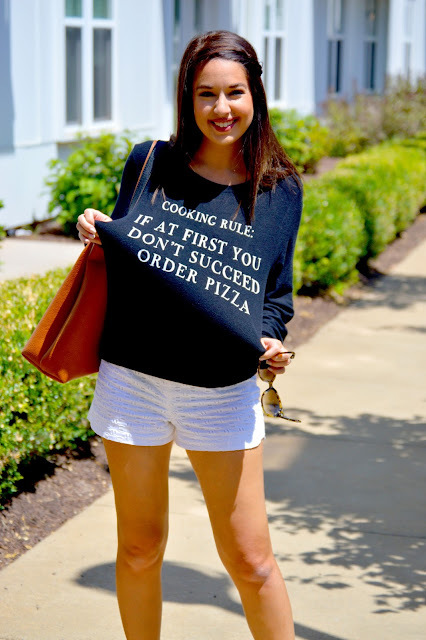 This sweatshirt nailed it and I now need it in my life! Thanks for sharing. You are so cute. Love your sweatshirt haha - pizza is always my go-to! It is super fun! I am in love with these fun shirts and sweatshirts. Great pics!